Battery cases, capacitor and transformer cans, toroid shells, instrument housings, circuit boxes. Potting forms are pieces of black epoxy tubing cut from 18" lengths molded on any of the mandrels in our mandrel list. The inside size is determined by the mandrel you select. The outside size is a function of the inside size and wall thickness - generally .030" - and their tolerances. A & B The mandrel on which the tubing is wrapped determines the inside dimensions of the tube or form. The tube ID will run up to .010" over a fractionally listed mandrel, and up to .005" over a decimally listed mandrel. W + or - .005" on .030" wall. L + or - .005? Above tolerances for sizes up to 2". Header plates are fabricated to fit the open end of a piece of the first tube made on your order to guarantee a good fit. Since the header lip adds. .010" to the length of the tube and occupies .020" of the inside space when assembled to the tube - allowance should be made when specifying cut length of tube. A & B matching Headers are made to provide a snug fit into the open end of the tube or form. 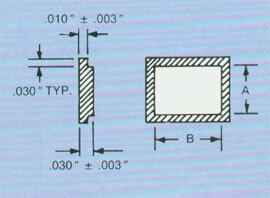 Tolerances of +.000" - .010" will be held on A & B dimensions only when headers are ordered without matching tubes. 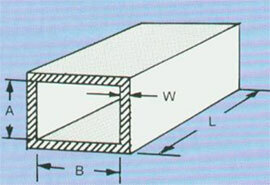 The .030" side lip can be varied to .020" or .060" wide and to .015" or .020" thick to match the most rectangular and selected round tubes. Sandblast inside surfaces for compatibility with potting compounds and with adhesive used to bond the header to the tube. Bond the header to the tube after sandblasting. Provide lead wire holes, terminals can be staked in place, and silk screening is available. Add 1oz copper foil lining for the R F shielding or heat sink requirements.